Welcome to the July edition of Kino-mo news. We'll share with you our latest news and case studies from all over the world where HYPERVSN Wall and single units were successfully used by our clients and partners. In June a large 12-unit HYPERVSN Wall was used by ABB to create a special booth makeover for Posidonia exhibition, Greece. ABB booth was a major draw for all visitors of the trade show with HYPERVSN holographic visuals showcasing ABB solutions at their best. The content was created by Adlabs London, HYPERVSN certified partner in the UK. Watch our video to see how it was implemented. Together with DreamICT, our partner in South Korea, we were honoured to take part in the UK 4IR Conference in July this year. Natalia Pirtskhalashvili, Kino-mo Business Development Executive, made a speech about the next generation of visual solutions and took part in the panel discussion. UK 4th Industrial Revelation Conference was a global event organised by the Department for International Trade to discuss and outline new opportunities for the UK and ROK in the Era of the 4IR. One of the highlights of this month was our participation in a live music performance. Together with the Vibes, a popular cover band in Singapore, HYPERVSN characters and visuals brightened up the atmosphere in 'The Beacon' bar. We also had an interview with Rafi, the leader and director of the cover band, where he shared his opinion about HYPERVSN and its application in music and entertainment. Parko Publicidad S.A, our partner in Mexico, took part in World Golf Championshipwhere they installed HYPERVSN holographic displays. It was a great sports event attended by over 50 thousand people. Parko held a interesting poll with visitors once they were leaving. They found out that 74% retained brand awareness of the products that appeared on HYPERVSN displays. In comparison, TV commercials also present at the competition generated only 17%. 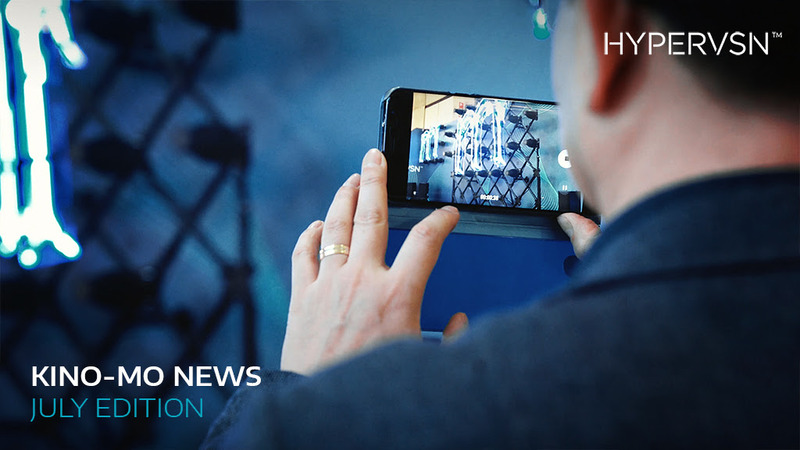 This is convincing evidence of how HYPERVSN holographic technology can effectively boost brand awareness and build customer engagement. With Together+, our partner in France, we took part in an exciting 15-day campaign for Moet Hennessy. A stunning 6-unit HYPERVSN Wall was installed in Moët Hennessy private space at Roland Garros where they greeted all influencers, VIP clients and partners of the venue. Juicy 3D holographic visuals of Moët & Chandon, Veuve Clicquot, Ruinart and Hennessy were instantly catching guests' attention, inviting them to grab a drink and relax. Copyright © 2018 Cosmic Information & Technology Ltd., All rights reserved. Cosmic Information & Technology Ltd.
312, Sarthik II, Opp. Rajpath Club, S. G. Highway, Ahmadabad 380054.